Dearest Blog: Yesterday it was off to Marquee Cinemas for Oceans 8 and Hotel Artemis, or, how best to waste some of the most talented, interesting, and beautiful actors working today. First on the docket: Oceans 8. Oceans 8 isn't really a good movie, nor is it a terrible movie. The one thing it absolutely *should* be is a fun movie, but, sadly, instead it's rather dull. Bad news out of the way first: These characters are AWFUL...caricatures unworthy of the least of the actresses to embody them, nevermind the goddess that is Helena Bonham Carter. The dialogue is especially awkward at the start, though it improves slightly as the movie progresses. The humor is also spotty, occasionally amusing is about as good as it gets. Even the heist itself is a letdown; it seems clever, yet its execution never feels as edge-of-your-seat as it should. Oceans 8 clocks in at 110 minutes and is rated PG13 for "language, drug use, and some suggestive content." 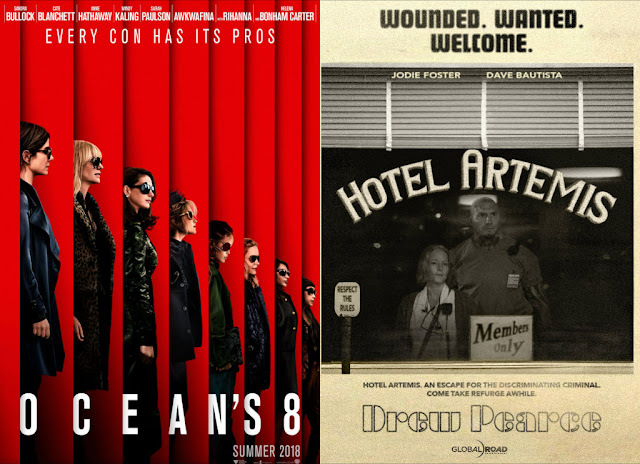 With a lesser cast, Oceans 8 would be a passable but forgettable bit of summer escapism. Even as sub-par as it is, there are worse things than than watching some of Hollywood's best actresses punching below their weight. Of a possible nine Weasleys, Oceans 8 gets four and a half. In riot-plagued 2028 Los Angeles, a nurse runs a secret, members-only hospital for criminals. Dear reader(s): Though it's nearly impossible to do in the Internet age, I went into Hotel Artemis cold, save for one headline that crossed my Twitter feed early yesterday: "What Made Jodie Foster Agree to Star in the Worst Movie of the Year?" So...lowered expectations, then? I feel like I can't be the only one who's at least a little bit over the whole dystopian thing, but Hotel Artemis seemed an interesting enough idea, and a cast that features Jodie Foster, Jeff Goldblum, Sterling K. Brown, Zachary Quinto, Sofia Boutella, and Charlie Day sounds can't-miss. Sadly, like Oceans 8, Hotel Artemis gives its incredible talent only cookie-cutter characters to work with. Even the good guys are unlikable, though (with very limited screen time) Jeff Goldblum is a delight as one of the baddies. If you're squeamish about violence or language, you'll want to check in somewhere else, but if you don't mind a side of blood and F-bombs with your action and criminal machinations, Hotel Artemis is the place for you. Hotel Artemis runs a quick 93 minutes and is rated R for "violence and language throughout, some sexual references, and brief drug use." Hotel Artemis takes an interesting premise and turns it into a by-the-numbers thriller. It's not fair to call it the year's worst movie, but it's certainly nowhere near its best. Of a possible nine Weasleys, Hotel Artemis gets five.